BOISE, Idaho -- Structural changes at two Snake River dams in Washington state are helping more endangered sockeye salmon make the trip upstream to central Idaho this year, federal officials say. The permanent system at Lower Granite Dam and a temporary system at Little Goose Dam pull up cold, deep water for fish ladders to combat high temperatures that discourage fish from completing their journey. The success of the new systems could lead to similar changes at other dams on the Snake and Columbia rivers. "The strategy of putting cooler water at the top end of the ladder appears to be effective," said Ritchie Graves of the National Oceanic and Atmospheric Administration. "It takes a while to learn how to do it correctly." 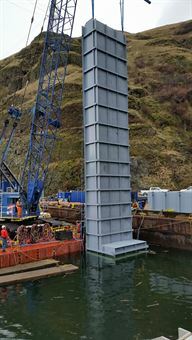 The permanent structure installed by the U.S. Army Corps of Engineers at Lower Granite Dam earlier this year cost $1.2 million and follows the massive die-off of sockeye salmon in the Columbia Basin in 2015. Managers say an unusual combination of low water and an extended heat wave pushed water temperatures past 70 degrees, lethal for cold-water sockeye. A National Oceanic and Atmospheric Administration report released in April cited hot water throughout the basin as the cause for the die-off, but also noted a lack of action by federal managers as playing a role. The report said one of the factors contributing to the deaths of sockeye salmon was "fallback," a tendency of fish to successfully climb a dam's fish ladder but then, running into warm water, decide to go back downstream, often via a dam's spillway or through the turbines. Fish that survive use up energy reserves, decreasing their chance of reaching their destination. Officials say fallback is a problem at many dams in the system. Snake River sockeye have to pass eight of them to get to central Idaho. "We want to get (salmon) to where they're going as quickly as possible," Graves said. "Part of that is making sure there are no delays in the ladder system." That led to the fish ladder changes that appear to be working. In 2014, about 25 percent of sockeye fell back at Lower Granite Dam. This year with the new system, that dropped to 5.5 percent. "The ladder exit shower has worked about as well as we could have hoped for at Granite," said Russ Kiefer of the Idaho Department of Fish and Game. The permanent system at Lower Granite Dam pulls up water from about 70 feet deep, which in summer is about 10 degrees cooler than surface water, and uses a spray system near the top of the ladder to create a plume of cold water. A temporary system costing $342,000 is in place at Little Goose Dam. Kiefer is a member of a basin-wide technical team considering putting in a permanent system at the dam. He said similar systems at dams farther downstream would tend to lose their effectiveness as the reservoirs themselves are hotter and pulling up deeper water might not make a significant difference. Overall this year, Snake River sockeye are doing much better than last year with cooler water temperatures throughout the Columbia Basin. About 1,250 of the fish crossed Bonneville Dam on the Columbia River this year, and about 400 have arrived in central Idaho so far, with about another 100 expected by the end of September. Last year, an estimated 4,000 Snake River sockeye crossed Bonneville Dam in what managers expected would be one of the best-ever returns to high mountain lakes in central Idaho. But only about 40 fish survived the 900-mile journey. "This year, Mother Nature helped us out," Kiefer said.